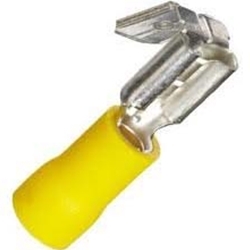 Piggyback Terminals Quick Disconnect Vinyl Yellow (12-10) TMR ST182 Bag of 100. The .250" Piggyback quick disconnect is designed for crimp-on connection to .250" male tabs found on fuse blocks, speaker terminals, etc. The extra male tab allows additional circuits to be added easily to existing connections. Electro-tin plated copper terminals with flared vinyl insulation for easy wire insertion. The flare overlaps wire insulation providing support for the terminated wire.